This week, shipping commemorated the grounding and sinking of the cruise ship ‘Sea Diamond’ off the Greek island of Santorini in the Aegean Sea. 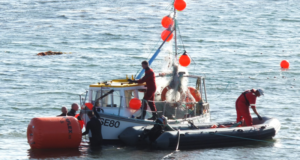 The incident resulted in two fatalities, but it is still discussed for lying at the bottom of Aegean Sea as a ‘toxic bomb’ in the local marine ecosystem. Learn from the past: Stellar Daisy sinking: Two years on and what? The cruise ship departed at noon of 5th April 2007 from Heraklion, Crete, to Santorini. Shortly after departure, the oil pump in one of its four engines was damaged, “with the master neglecting to inform anyone,” Greek media reported at that time. Water ingress began. The master commanded closure of the 19 watertight doors, which had remained opened, but it was too late. The water caused a blackout in the electrical panel and a fire broke out. The ship remained drifting towards the bay of Fira. 45 minutes after the crash, abandonment order was given. Due to blackout, launch of lifeboats could not operate as planned. Several private vessels nearby rushed to assist. The 1,195 passengers were safely evacuated in three-and-a-half hours, with four injuries. The ship was towed off the rocks, and her list stabilized. Later, it was reported that two French passengers were missing. The large amount of water ingress led to the ship sinking in the next morning, only a few hundred metres from the shore. It has been speculated that the deep, almost vertical shore of the bathtub-like caldera made it impossible to beach the ship and save her from becoming a total loss. Out of the 1,195 passengers onboard, two French passengers, Jean Christophe Allain, aged 45, and his daughter Maud, 16, are still unaccounted for and presumed dead. His wife and son were rescued. About six months later, a Greek scuba diver gathering evidence in the shipwreck died from decompression sickness after ascending too quickly. Several experts have expressed concerns regarding the impact of toxic pollutants of the ship wreck on the ecosystems of the area. Apart from oil, the leakage of numerous other toxic and dangerous substances into the marine ecosystems has been ongoing, since the wreck is still on site. As the wreck corrodes, the pollution levels are expected to rise. The Captain and owner company were fined for causing marine pollution, but not for the two fatalities, as the bodies were never found. In 2013, a Greek court convicted nine of a total of 13 defendants for their role in the sinking. The Captain received the strictest sentence to 12 years in jail for negligence that led to manslaughter and marine pollution. Eventually, after many years of trials, in 2014, the Piraeus appeals court ruled the Captain, the first mate and the head of operations ashore were all guilty of negligence. The Captain was handed a five-year jail sentence, which he could buy out for EUR 9,125. The head of operations was given a three-year term suspended, and the first mate a 26-month suspended sentence. Everyone else, including two representatives of the cruise company, was acquitted. Practically, no time was served in jail. Human error played an important role on the outcome. 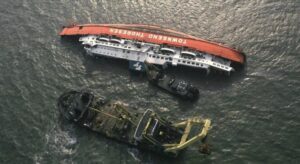 Although no official investigation report is available, international media reports and court rulings indicate that negligence led to the disaster. For example, there was a dispute shortly after the accident as to whether the watertight doors had been closed, and if so, at what time. What remains notable with this case until today is that no coordinated efforts have been made for the wreck removal. Thodoris Tsimpidis, Director, Archipelagos Institute of Marine Conservation, noted that the paradox of the Sea Diamond case is that more than a decade after, the Greek Government has not applied the law related to the salvaging of shipwrecks, which defines the obligation of safe wreck removal at the expense of the shipowner and respective insurance company. It is also illogical that it took nine years for the completion of the criminal trial for the Sea Diamond shipwreck, after which the captain’s and shipowner’s guilt was finally determined. In October 2017, Greek Minister of Merchant Shipping, Panagiotis Kouroublis, ordered removal of the wreck. 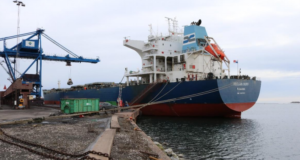 It was not revealed who would pay for the wreck removal, as the government had made clear that it could not afford the salvage and that the shipowner had to deal with it. However, the owner company reported the decision of the Piraeus Court of Appeal saying that his lift is not possible. Mr. Tsimpidis compared the case to another recent tragedy, involving the cruise ship Costa Concordia in 2012, in Italy. 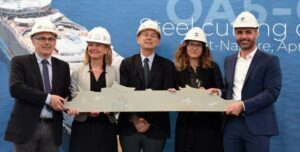 In that case, the Italian authorities obligated the ship owning company to salvage the wreck, which was completed within 14 months and cost over 1 billion euros. Originally, the ship was built in 1984 for Birka Line as’ Birka Princess’. In February 2006, she was sold to a Cyprus-based company and renamed to ‘Sea Diamond’.